The Board of Directors and Staff of The Dressage Foundation wish to thank all of the sponsoring groups that have supported The Dressage Foundation by holding a Benefit Class. Funds generated by Benefit Class sponsorships help further dressage education in The United States. 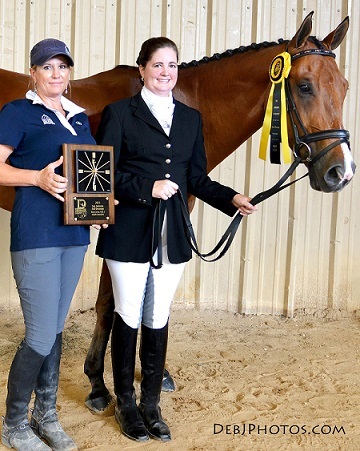 The Benefit Class sponsored by The Dressage Foundation features striking Black & Gold Benefit Class Ribbons for the winners of first through sixth places in class competitions held by Foundation supporters. We also have available a beautiful wall clock, mounted on a 9X12 walnut base for a 'special award' presentation. The Dressage Foundation suggests a minimum donation of $250 for ribbons only, and a $350 donation for ribbons and a clock.